I've bought a few V fresh drinks over the years, some of which look nice and some of which look like endurance based game shows. This is the latter. Pandan leaves are green and believed to be medicinal. They've certainly added a sweetness to the drink too. But what about the floaty bits? 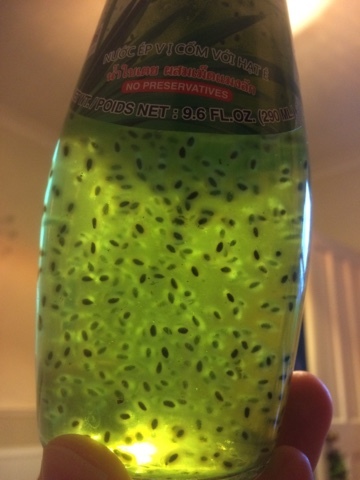 Quite why someone would think about putting basil seeds into a drink, and quite why they develop a fluffy coating and float so menacingly I'm not sure. 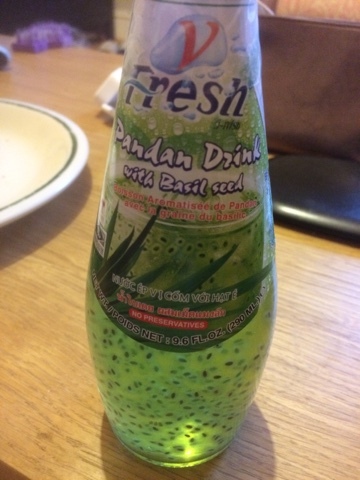 I bought my first bottle of basil seed drink three years ago and it still remains undrunk due to its scary nature. It's the only thing that I've ever bought from an oriental grocer that the shop keeper has tried to get me to put back - and she was clearly right to do so. Those original two scary drinks are on my shelf to this day. I decided to drink this one when really thirsty to see how it went, and not to let it languish with its others. And it did go as expected. The texture isn't really noticeable, it's not like a soy shake or bubble tea but the seeds are certainly there. The flavour is pretty odd though. You have the leafy sweet liquid flavour with a heavy basil base note booming underneath, kind of like a tea but not a good tea. I'm not 100% sure that it's not the other way around - there is so much crazy and artificial going on that I'm not convinced either way. And like alcoholic drinks, even though those first mouthfuls trigger evolutionary warnings to throw the poison away you'll keep drinking, and thinking about that odd flavour mix. I'm not sure whether this is a wise thing but I drank half and popped it back in the fridge. And now I keep thinking about it. Like a practical joke that just keeps giving I think that once you succumb to the trial that is the flavour and contents you could drink this in front of people to mess with them, and then let them try it. They'd hate it of course, but eventually their mind would wander back to the strange concoction and they may even be termpetd to buy it themselves. I'm not risking the out of date ones, they can go on the compost heap to confuse the mini beasts and spawn further horrors.